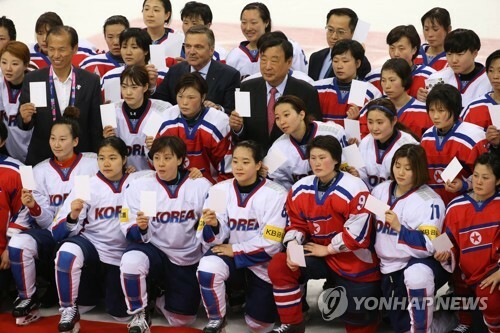 South Korea has proposed assembling a joint women’s hockey team with North Korea at the upcoming PyeongChang Winter Olympics, a senior government official said Friday. Vice Sports Minister Roh Tae-kang said putting together the unified Korean team was discussed during Tuesday’s inter-Korean meeting, along with a proposal for a joint parade into the opening ceremony at the Feb. 9-25 Olympics. Roh made the comment while visiting Jincheon National Training Center in Jincheon, 90 kilometers of Seoul, for a new year kickoff meeting. Roh was a member of the South Korean delegation at the meeting, after which North Korea agreed to send a delegation to PyeongChang 2018, the first Winter Olympics to be held in South Korea. The South’s proposal of a joint hockey team wasn’t immediately made public on Tuesday. The North didn’t immediately respond to the joint march proposal. The two Korea’s are likely to hold working-level talks next week to further discuss the issue before a Jan. 20 meeting to be chaired by International Olympic Committee (IOC) President Thomas Bach at the IOC headquarters in Lausanne, Switzerland. The IOC said the meeting will involve the PyeongChang Olympics organizing committee, leaders of the national Olympic bodies for the two Korea’s and other high-ranking government officials. The meeting “will take a series of essential decisions,” including the number and names of North Korean athletes to participate in PyeongChang, and also issues related to flags, anthems, ceremonies and uniforms. Seoul’s Sports Minister Do Jong-hwan first raised the possibility of one hockey team in June last year, though it was immediately met with criticism. Those who opposed the idea said it was unfair to take away roster spots from South Korean players to make room for North Koreans and risk disrupting team chemistry. The Korea’s fielded joint teams at the 1991 World Table Tennis Championships and the 1991 FIFA World Youth Championship. But they have never had a unified team in any sport at multi-sport competitions like the Olympics or the Asian Games. Roh didn’t elaborate further on whether the North had agreed to form one hockey team. But he did say he is seeking cooperation from the IOC and the International Ice Hockey Federation (IIHF) to add extra roster spots for the Korean team, which would keep the current South Korean team intact. “Even if we have one Korean team in women’s hockey, we’ll make sure it will not come at the expense of South Korean players,” Roh said, adding that the IOC and the IIHF are currently seeking understanding from other participating nations. The women’s hockey roster is set at 23. An official from the Korean Sport & Olympic Committee (KSOC) said South Korea is hoping to expand it to 35 players to accommodate North Koreans. South Korea, ranked 22nd, will make its Olympic debut against No. 5 Sweden, No. 6 Switzerland and No. 9 Japan. North Korea is ranked 25th. In April last year, South Korea, coached by former Canadian star Sarah Murray, defeated North Korea 3-0 at the IIHF Women’s World Championship Division II Group A tournament in Gangneung, the host city for all hockey games during PyeongChang 2018. For the PyeongChang Olympics, North Korea doesn’t have any qualified athletes, and will need special wild-card spots granted by the IOC. In figure skating, the tandem of Ryom Tae-ok and Kim Ju-sik could receive a spot. They qualified on merit last September but North Korea didn’t confirm their PyeongChang participation on time the following month.